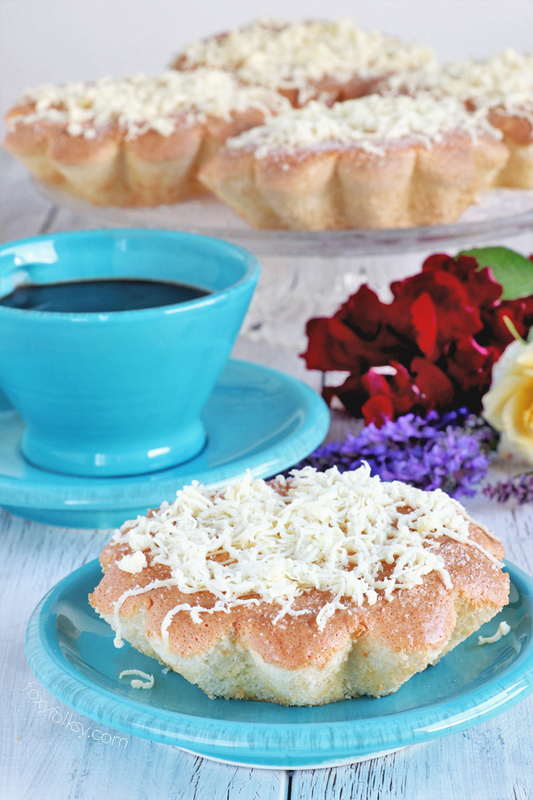 Mamon is a Filipino mini chiffon cake that is a popular afternoon snack. Get this simple and easy recipe for that light, airy and fluffiest Mamon ever! Update: Spoiler Alert! To manage expectations and avoid disappointments of those looking for a Mamon recipe that is similar or a copycat of Goldilocks Mamon, this is not it! I sometimes get comments that although this Mamon tastes good they are disappointed that it is not like that of Goldilock’s but if you read below you would know that already. All the same, recipe for Goldilock’s Mamon is now on my to-do list to answer other peoples requests. Someone has requested a recipe for Mamon some time ago and I finally found the one that I am quite satisfied with to share here. 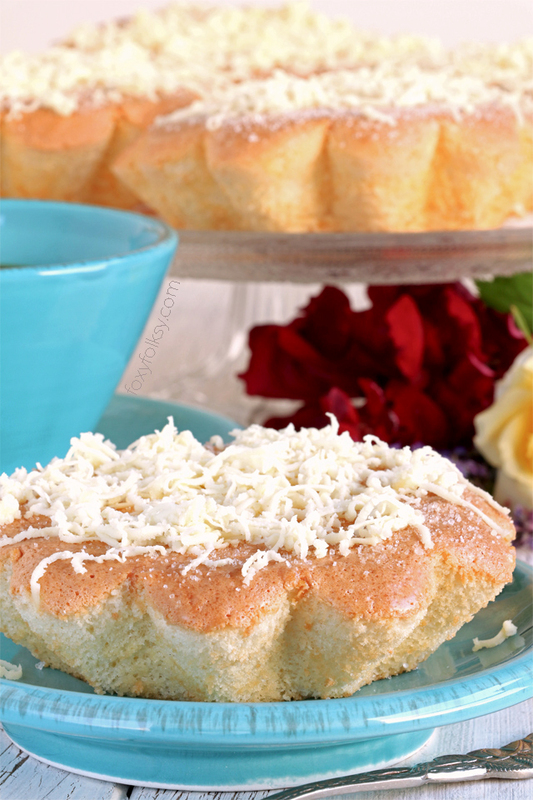 Mamon (‘Mah-mon’) if a Filipino chiffon cake usually in a form of a muffin. You can find them almost in any bakery in the Philippines. 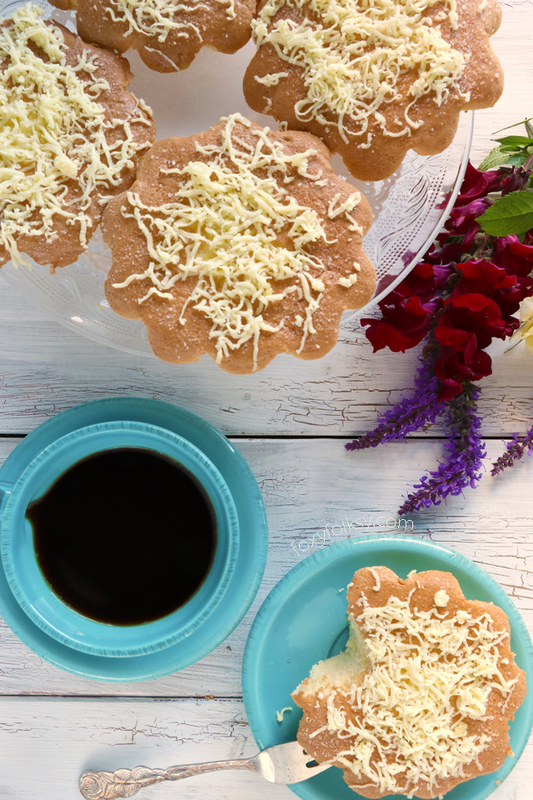 A simple Mamon is just brushed with butter and sprinkled with sugar but you can also top them with grated cheese and make them more special. I’ve been searching for a Mamon Recipe that is similar to the one I know back home. Light, airy and really fluffy. Sadly, a lot of the recipes I found were looking too dense to be called a proper Mamon. They lack the springy look that they are usually associated with. I think this the case because others make Mamon using a sponge cake recipe while in my opinion, it should be a chiffon. What is the difference??? Butter! 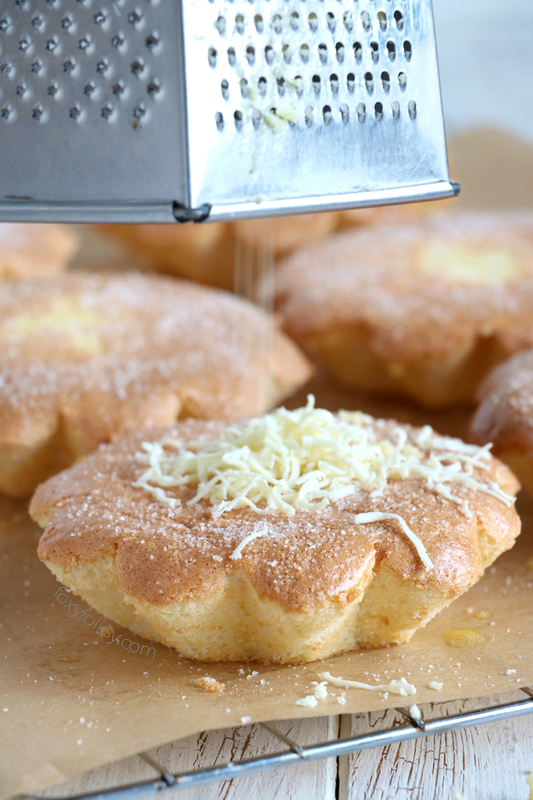 Sponge cakes (usually) use butter while chiffon cakes use liquid oil. Good thing I came across the Mamon recipe from Heart of Mary. I used her recipe and just made some minor changes. It worked perfectly and I am quite happy to have the results I am aiming for! (Update! Feb. 5, 2018 – seems the recipe from Heart of Mary got deleted, can’t find it anymore). I am not saying that the other Mamon recipes are bad or anything, on the contrary, I think they are also terrific. But I was looking for something specific, an idea of what Mamon is that is stuck in my head. It is also quite surprising how well they keep. I made these 10 days ago and I kept some in a plastic container covered with only a cling wrap and left it on our kitchen counter. Line the bottom of Mamon tin molds with a parchment paper, so it is easier to remove once baked. No need to grease. Preheat oven to 170°C/350°F. In a mixing bowl, beat egg whites using a hand or stand mixer at low speed until foamy (about a minute). Add the cream of tartar and continue beating at medium speed until soft peaks form. Gradually add granulated sugar (a spoonful at a time) and beat until stiff peaks form. Set aside. In a larger mixing bowl, add the egg yolks, oil, milk and vanilla extract. Mix using a hand or stand mixer until frothy. Place the cake flour, powdered sugar, baking powder and salt in a strainer or sifter. Sift the dry ingredients into the egg yolk mixture in 3 to 4 parts interval mixing it with a spatula or spoon after every addition. After all the dry ingredients are added to the egg yolk mixture, beat together at medium speed until the texture becomes lighter and the color lighter (approx 3-4 minutes). Now gently fold in the meringue (egg whites) into the egg yolk and flour mixture in 2-3 parts until well combined. Fill up about 3/4 of the prepared Mamon tins with the cake batter. Gently tap each tin to move air bubbles and to level off the batter. Arrange them on a large baking tray. Bake them for 25-30 minutes or until tops turn golden brown and inserted toothpick come out clean. Immediately invert the tins onto a wire rack lined with parchment paper. Tap the tins to release the cakes. Turn them topside up. Brush the tops with melted butter while warm. Sprinkle with granulated sugar and grated cheese. I got my Mamon molds from the Philippines but I found similar molds or alternatives on Amazon. Just click on the images below. But you may also use a regular muffin tin forms and you can also use muffin or cupcake liners so that the after baking is easier to handle. Hello. I made this today and it tastes good and texture is very similar to our fave Red Ribbon mamon! (though too sweet for my taste. I’ll adjust the sugar next time). I also flipped them after baking similar to what you showed in the video but how come the brown top stayed in the paper? Yours appeared to be in tact. So after it cooled then when I flipped them back, the top doesn’t look good anymore. Any tips for making it right next time? Why do we need to flip? Hi Maria, try to grease your paper with some oil or butter or sprinkle powdered sugar on the paper so it will not stick. Do tell how it goes with the reduced sugar. Hi Camille, I am pretty sure it should work. But, I do have a sponge cake recipe that I prefer to use for making cakes. Thanks for sharing this recipe. I’m a newbie in baking and I miss home so I tried making this today. The smell is really good but somehow there’s an aftertaste. What do you think could have caused that? What did I do wrong? Hhmmm…I cannot really say unless you give me some clue as to what kind of aftertaste you are refering to. I could only guess that you are refering to eggy taste which can be from the eggs you used. Hello. Can I use regular sugar instead of powdered? Do I still have to invert them even if I’m not using the tin molds? I use the oven safe baking cups. Usually if you invert them the tops get messed up. I like to eat mine without anything on top! Thank you so much. Hi Debbie, adding regular granulated sugar to the flour mixture will deflate the whipped egg whites when you add it later and it will not be as soft and spongy. If you really need to use regular sugar instead of the powdered one, I would suggest adding the sugar (1/2 cup instead of 1 cup) to the egg yolk mixture and make sure it is completely dissolved. Do you have recipes for Ensenada and Empanadas? do you need to do anything special to the parchment paper before you line the mold with it? No, you just cut them to fit the bottom (only) of the molds..that is it! Hi! Can’t wait try this recipe craving for mamon! Do you have to grease the molders? Thanks! Hi Irene, I do not grease my molds when making this mamon recipe. Hope you like it! I’ve tried a lot of mamon recipes, some good, some not so good. In all of them, the mamon deflates to almost half its size. My molds are 1.5 in in height, when the mamon just comes out of the oven, its level with the top of the mold, looking light and airy. I invert it immediately to the wire rack. When cooled and released from its mold, the height of the mamon is just 3/4 in only. Does yours shrink the same way? Any ideas on how to prevent this shrinkage? The mamon is still light and tasty, but the presentation makes it look like its been squashed, not airy and fluffy. Hi Seb, My Mamon stayed lofty and did not deflate or shrink as you can see from the pictures. I find that this could happen if the whites are beaten at high speed. I usually only use low to medium speed to create more stable air bubbles that will not deflate during or after baking. Try to cook it longer too until it is completely light brown on top. You are welcome May and I am happy you and your daughter liked it! Can I use silicon molds instead of tin molds? Hi! I used to make the same mamon from Heart of Mary, and i was hoping to make another batch tonight but it seems like the page has been deleted 🙁 Luckily i came across your blog ❤️ I have a question though, what are the changes you made between your recipe and hers? Just so i know what to expect 🙂 Nonetheless, i’m excited to try your version! Hi Rica, just checked the link and doubled check the blog and it seems you are correct, can’t find the recipe from Heart of Mary anymore. It’s been a while since I wrote this recipe and I cannot really remember all the changes I made. I do hope you like this one though. Looks good! Question: What kind of cheese did you use to shred on top? Hi Vanessa, it is processed cheese that is commonly used in the Philippines (Eden, Quickmelt, Queso). You may also use other kinds of cheese like cheddar. Hi, where can we get cake flour here in Germany? Can’t seem to find one. Thank you for sharing your recipes! Great help especially this coming christmas season. Not easy to be away from home. Hi Beatrice, 405 Type flour should be fine. 550 is more like the equivalent of all-purpose flour, so I’ve read. Just wondering what type of cheese I can use for mamon and ensaymada? Thank you soooo much for this mamon recipe! I just tried it today, and the outcome is perfect! I can not believe i made it perfectly, since it’s my first time to try them! Sooo yummy!!! Thank you for sharing! Keep up the good work!!! ???????????? I am really glad to hear that! Kudos on your very successful first attempt at making Mamon! ???? What’s the different between granulated sugar and powder sugar? Hi Dolly, powdered sugar, also known as Confectioners sugar, is granulated sugar that is ground to a smooth powder and then sifted. It contains about 3% cornstarch to prevent caking. It is easier to dissolve compared to regular granulated sugar. You could also use 1/2 cup granulated sugar to replace the powdered sugar in this recipe. But make sure that you beat the batter well (before adding the meringue) to make sure sugar is dissolved. I’m typing this without seeing what I’m typing. Right now it’s a Walmart Ad. But it might be AdChoices that’s acutally doing it. Ok. I will check it with my ad network. Thanks so much for your feedback. Hi, I checked in today and it looks like the problem has been solved. Thanks for the quick resolution! Hi Leah, thank you really so much for taking the time and effort to let us know about the problem, I won’t even know about it if you didn’t. Everything looked fine from here (Germany) but it is possible that the Ads showing from your side (US) were the ones causing it. Hope it is fixed for good now. ☺️ ???? I really loved them Jhuls and I am sure you will too! I really like your website and follow it regularly. But lately, the ads just block the screen, it’s hard to see the contents. Maybe you’re not aware. I understand you have to earn some money from the website but I wonder if it will backfire when nobody checks in anymore. It’s a shame because like I said, I really like your recipes. Thank you for bringing this to my attention. I gave my Ad Network specific instructions that I do not want ads to block any of the content. I will have to talk to them again. It would help me if you can say which ad/s was it? Are you using mobile or desktop?